It is difficult to envy David Cameron. The first prime minister in recent memory to suffer the ignominy of governing in coalition, Cameron’s chance of achieving a Conservative majority at the second time of asking are almost nil. The odds are that he will be a one-term Tory, going down in history as the man who failed to secure a majority against Gordon Brown and lost to Ed Miliband, two of Labour’s least inspiring leaders. That seems to be the reasoning among the growing number of Tory backbenchers who have decided they don’t fancy sticking around for next year’s election. At the time of writing, two have announced they will be standing down this week alone – Chris Kelly and Tony Baldry – though it feels like others could say thanks but no thanks at any minute. Douglas Carswell’s defection to UKIP shows that Nigel Farage’s party will not just disappear, as the Tories, and many others in Westminster, had hoped. The departing Kelly is a right-wing eurosceptic who represents Dudley South, a UKIP stronghold which is a target seat for the party next year. UKIP have the potential to unseat at least a handful of Tories. An unconvincing Conservative leadership is failing to inspire those under threat to stay and fight. The recent resignations are illustrative of a pessimistic, divided party predicting defeat in nine months’ time. What if Cameron does manage to defy the odds and lead the Tories to a famous win next year, forming either a minority government or Coalition 2.0? That would be a considerable achievement given the Conservatives’ current position, but any feeling of triumphalism would not last beyond the victory party. Cameron would have to deliver an in/out referendum on Britain’s membership of the European Union. There can be no fudge this time round; he has said a referendum will be a red line in any future coalition negotiations. That means Tory party politics in the two years running up to a 2017 plebiscite will be consumed by infighting over Europe. The prime minister, possibly with a vindicated and ambitious George Osborne as his foreign secretary, will seek renegotiation with Brussels. Perhaps they will succeed. Perhaps Europe will cede sovereignty back to Britain. Perhaps Cameron will be seen as the man who saved our relationship with the continent, step down a hero in 2018 and make way for Osborne to move into Number 10. But it would take nothing short of a miracle for that to happen. According to reports this week, 100 eurosceptic Conservative MPs are planning to reject their leader’s attempts at renegotiation before he has even had the chance to get started, planning to promise in their personal manifestos that they will vote to leave the EU regardless. A third of the parliamentary Tory party is already plotting to undermine their prime minister before he has even been re-elected. If Cameron actually does manage to stay in Downing Street next year, he would require superhuman strength to keep his party from tearing apart. This is why, believe it or not, I almost feel sorry for David Cameron. If he wins, he will face internal ructions that could destroy his party for a decade. If he loses, he will be condemned by history as a one-term Tory. These are events that are inevitable and, through some fault of his own, events which he has no control over. 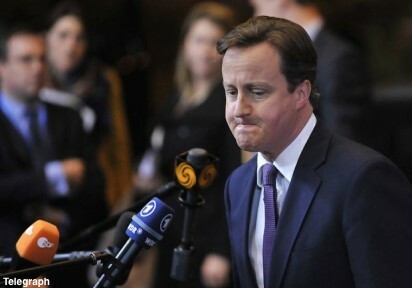 Cameron is a prime minister with declining authority and little control over his destiny. Whether he is around for nine more months or four more years, few would want to be in his shoes.